It was raining on the day of Charlotte's bridal session in Myrtle Beach, SC so we had to quickly find an alternative to shooting on the beach like we had planned. I thought of how dramatic a shoot in the largest local aquarium could be so I call up Ripley's at Broadway at the Beach. They were incredibly accommodating and gave up free entry into the space. We shot with jellyfish, in the tunnels under the shark displays, and for this image, in the Stingray and Shark feeding area. There were so many images and all of them were magical. Eventually, we even made it out to the beach for a midnight shoot! I am an artist first and so I will use whatever tools I have at my disposal to get why I see in my head. In the case of this image, I wanted the sharks and stingrays circling around Charlotte in a musical, almost mathematical pattern. I shot multiple images concentrating on each segment of the frame and then comped 9 images together in photoshop to achieve this final piece. And it came out exactly how how I envisioned it! Photography, like any other art form, is about the mind and imagination of the artist, not only what is in front of the lens. Location: Ripley's Aquarium, 1110 Celebrity Cir, Myrtle Beach, SC 29577. 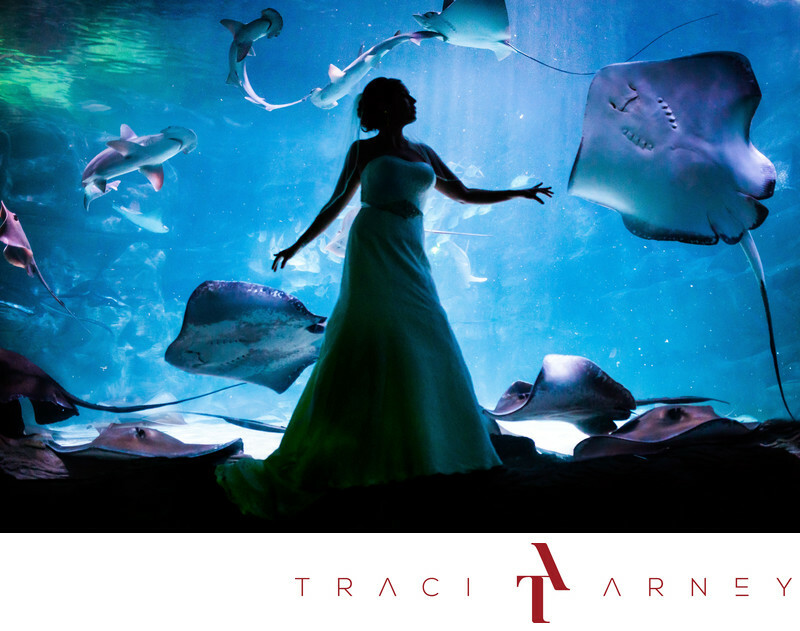 Keywords: Aquarium (9), Bridal Session (210), Charlotte (72), Myrtle Beach (36), NC Wedding Photographer (3), Ripley's Aquarium (3), SC (33), SC Wedding Photographer (3), TAP (153). 1/200; f/1.4; ISO 3200; 35.0 mm.